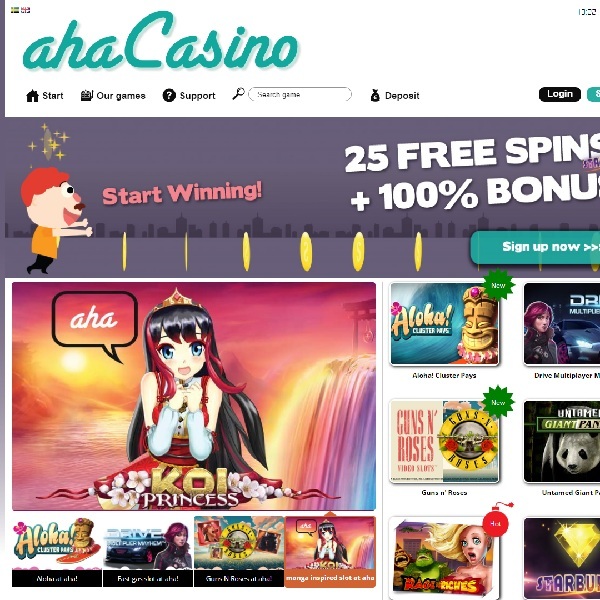 Those looking for their online gambling eureka moment may enjoy the brand new aha Casino which has just gone live. The casino is offering players games from Microgaming, Net Entertainment, BetSoft Gaming and more. Visitors will be spoilt for choice with hundreds of titles to choose from. The games are divided into slots which includes classic, progressive and video games, table games, other games and a live casino. Within each category there is a huge amount of choice with enough variety to suit every taste. Upon joining aha Casino members will be given 25 free spins on Starburst slot before making a deposit. There is then a 100% first deposit bonus of up to €200 absolutely free. The casino is licensed in Curacao and is available in English and Swedish. It offers customer support via live chat and email.